My oil painting ‘Lifting Fog on Ducie Beach, Bembridge’ has been selected for the Royal Society of Marine Artists exhibition in London. I very much enjoyed looking around the show last year and it felt nice to be in a gallery surrounded by paintings inspired by the marine enviroment, it had a good feel with everyone exploring all the many diversities of the one subject, the sea, and I had hoped to take part in it one day. So ‘one day’ has arrived and I am looking forward to visiting the exhibition next week. Most of the paintings are of the British coastline including mine that was painted on a beach in the Isle of Wight which is an island in the south where part of my family are originally from. Lifting Fog, Ducie Beach. Isle of Wight. 50cm x 70cm. Oil on Panel. I had hoped for a completely different feel when I set out to paint this one March morning last year, the sky was blue when I set out and I had planned to paint the view of the Bembridge Lifeboat Station with the tide breakers on the beach. I think that is why the sea is so fascinating because nothing can be planned and it all changes so quickly, the fog rises while the tide goes out, reflections in the water are there for a moment then they disappear while I am still trying to paint the sky and what is not there in the distance! My painting comes up under Bembridge along with other artists paintings too. You need to pedal down south to the Isle of Wight. It took me ages. But it is a really cool idea….here is a zoomed in screenshot. I look forward to the exhibition next week and I hope to see you there! Posted on October 4, 2018 October 4, 2018 Categories Art, mall galleries, marine artTags art, bembridge, isle of wight, landscape painting, mall galleries, marine art, oil painting, pleinair painting, royal society of marine artists, rsma, seascape4 Comments on Royal Society of Marine Artists Annual Exhibition, 11th – 20th Oct, Mall Galleries, London. 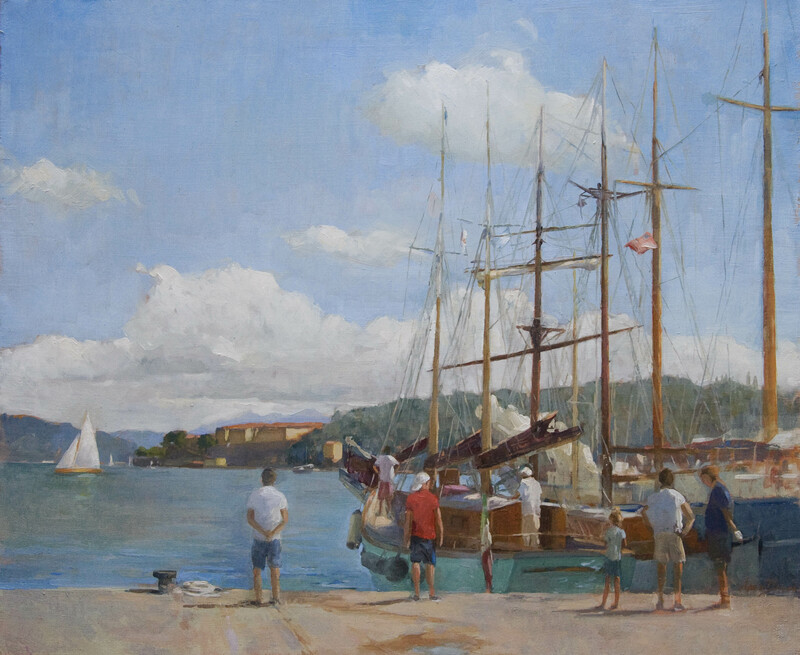 Posted on October 2, 2015 October 13, 2015 Categories boats, marine art, SeascapeTags art, boats, figurative art, italy, landscape, le grazie, Liguria, marine art, oil painting, pleinair, sailing boats, sea, valdettaro10 Comments on Painting in the Valdettaro Boatyard.